Projects currently included in the COIN-OR Optimization Suite are listed below (with links to the information for each one, and to any binary download page on Bintray). Pre-compiled binaries for a number of projects and platforms are available here. For more information on using these binaries, please visit the Binary Distribution project page. 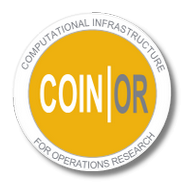 Note that that more recent versions of projects in the COIN-OR Optimization Suite are available on the COIN-OR download page on Bintray. You can find detailed instruction on obtaining, configuring, compiling, installing, and finally using the COIN-OR libraries at the CoinHelp (BuildTools) project page. An archive containing the source code for the latest stable release of each project can be obtained here or by checking it out using Subversion (SVN). See the FAQs for general instructions or go to the web page of the project you are interested in for more specific instructions (see here for a list of project web pages). BonMin, Basic Open-source Nonlinear Mixed INteger program solver on NEOS using AMPL input.